Sherlock Holmes is a 2009 film in which important elements, including the protagonists Sherlock Holmes and Dr. Watson, are borrowed from the well-known stories by Arthur Conan Doyle. The film was directed by Guy Ritchie and produced by Joel Silver, Lionel Wigram, Susan Downey and Dan Lin. The screenplay by Michael Robert Johnson, Anthony Peckham and Simon Kinberg was developed from a story by Lionel Wigram and Michael Robert Johnson. 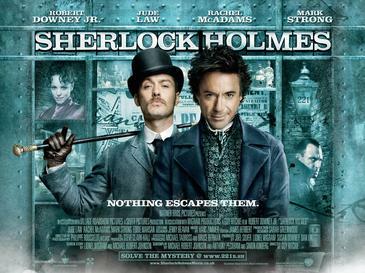 Robert Downey, Jr. and Jude Law portray Sherlock Holmes and Dr. Watson, respectively.